Masood Azam knows intimately the meaning of downsizing. 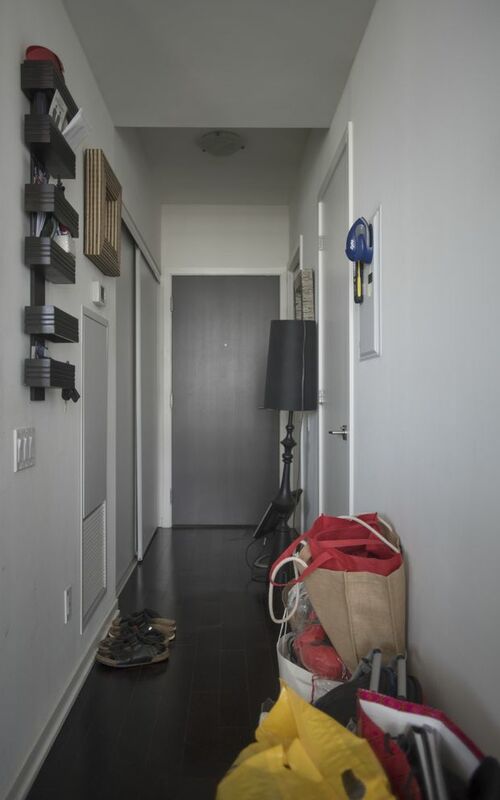 After his separation in 2016, the learning analyst went from a six-bedroom home to a 900-square-foot condo in Toronto – the “short end of the stick,” as he put it. The separation had dragged on, Azam said, largely because his wife couldn’t afford to buy him out of the 3,000-square-foot family home, from which she runs her business. Resolved to move on, Azam agreed to sell his half to her for a lump sum, “the minimum amount I would need in order to leave,” he said. A house was now out of the question for Azam, 44. Unluckily, he began his condo search in the spring of 2017 – the height of Toronto’s real estate market. Four months of bidding wars later, Azam found a two-bedroom for him and his 10-year-old son, for whom he shares custody. He’d gone $50,000 over his limit to land a space less than one-third the size of his matrimonial home. Boxes and bags of clothes and other items he doesn't have room to keep anywhere else are placed in Azam’s small condo. Azam is one of many divorced or separated Canadians readjusting to life amid yo-yo real estate markets in Canada’s big cities. Splitting up the family home is harrowing, not least of all for couples who buy in one market and are forced to sell and start over in a drastically altered real estate landscape just a few years later. Relinquishing the two-income life is a rude awakening for divorcées. Those who can afford to buy property again face a sobering downsizing. Many others can’t afford to buy back into their neighbourhoods. Some will rent for the rest of their lives, ship off to more affordable towns, or move back home with mom and dad until the dust settles. That’s actually not the worst-case scenario: Some couples staring down low equity and high debt can’t afford to split up. David Fleming, a Toronto broker with Bosley Real Estate, described two of his clients currently entangled this way. Fleming and other realtors see deep denial about downsizing in the divorcing set. People don’t understand that they don’t get to have the sprawling backyard for their kids or the two-car garage any more. Realtors often see some couples clinging against all reason to the family home. Robin Pope, a Toronto realtor, has seen people take extreme measures in these circumstances not to have their homes sold out from under them. They will hamper viewings, bar access to the property and purposely leave the place looking unkempt. “I’ve shown properties – not my listing but somebody else’s – and it was War of the Roses,” Pope said. There is a better way. Spouses who opt for mediation and the collaborative separation route often come up with less combative, more productive solutions for divvying up the family home. You’re battling your spouse and you’re battling yourself. A lot of people won’t let their ego take a hit. Sometimes, splitting parents will agree to delay the sale of the house so that their children can stay in their school catchment area until graduation, said Jacqueline Peeters, a Toronto family law lawyer. With this child-focused priority, one parent lives in the home, the other rents and “we sort out financial responsibilities to make the arrangement equitable,” Peeters said. That may mean the spouse moving out keeps more of the other assets, including pensions, RRSPS, investments or a cottage. Or, the spouse staying in the family home makes more of the support payments, so that the other can move out. Being imaginative is key, Peeters said. Still, rapidly spiking and flat-lining real estate markets can leave even the most collaborative exes reeling as one buys the other out of the matrimonial home. People taking over the family home face hurdles, too. They need to qualify for a new mortgage on a sole income, this after paying an ex out and swallowing legal fees. Increasingly, they turn to family to co-sign their loans so they can stay put. Another roadblock for divorcées? Canada’s new federal regulations for home buyers, passed last January, mean that lenders must “stress test” peoples’ finances to make sure they can pay off their mortgages should interest rates climb higher. Steve Robertson, a 44-year-old technology and business consultant in Orangeville, Ont., recently got hit with the stress test. Divorced in 2016 and renting since his separation in 2013, Robertson, who has good income, had prequalified for a mortgage. But when the time came to finalize, his lenders threw up red flags and then backed out, citing the stress test. Robertson said the new rules stigmatize the divorced. For the small army of professionals who work on behalf of stressed divorcing spouses – the realtors, lawyers, mediators and coaches – therapy becomes integral to the job. “I feel like a part-time psychiatrist,” said Patrick Rocca, Toronto real estate broker. “In our business, you have to be a chameleon.” Pope speaks of his “therapy sofa.” With splitting exes, “you have to be a really good listener,” he said. 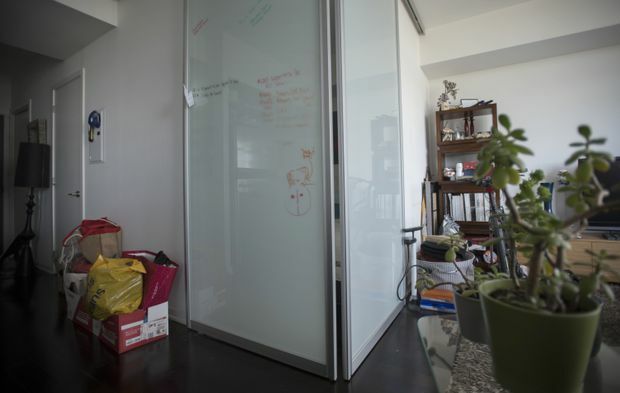 Azam shares this small condo with his 10-year-old son. After taking a serious financial hit, Toronto’s Azam said his new attitude is to “find that bright side.” Azam’s is his 10-year-old son, who has adjusted sweetly to the modest condo.